Shed Cleaner | Why Use Wood Cleaner on Garden Sheds? Garden sheds take the brunt of all weathers from the heat of the summer sun to the dark damp conditions of deep winter. Wind, rain and sun all contribute to shed timbers becoming discoloured and dirty with in-ground dirt and debris. The onset of mould, algae, mildew and other biological growth can also look unsightly and accelerate wood rot and decay. It’s for this reason that a shed cleaner should be used as part of the annual garden maintenance program. 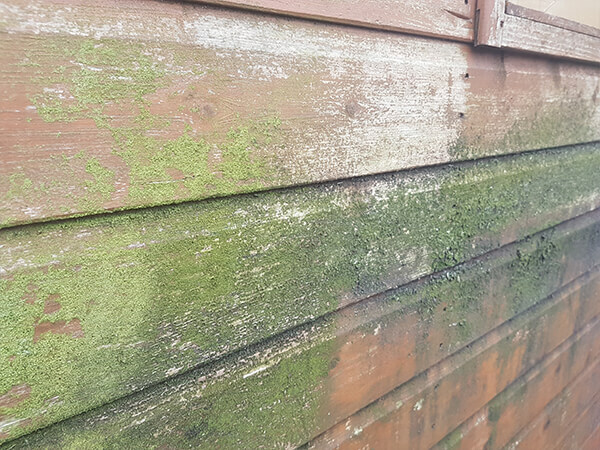 Apart from looking unsightly, if mould, algae or other signs of biological growth are present then its a good sign that the shed isn’t in the best condition and if left, will likely not last as long as it may have otherwise. As long as wood rot hasn’t taken a hold, this condition can be reversed giving sheds, summerhouses and log cabins a new lease of life. Wood cleaners are formulated to not only clean the visible signs of dirt, mould, algae and fungi, they also kill off the spores in the wood grain from which they grow. This means that once properly cleaned, and as long as a preventative wood preservative is applied after, mould, algae and other biological growth should not regrow. This process is based on bare wood garden sheds, or those that have been left untreated for a number of years and where the timber has perhaps turned grey or silver over time. If the shed has been previously painted or varnished and is showing signs of peeling, flaking or blistering, the old finish will need to be stripped back to bare wood before proceeding. This depends on how heavily soiled the shed is. if the wood is lightly stained with green or black patches, these can be treated with a mould and mildew cleaner. Once treated, allow the wood to dry and see if the stains have disappeared, if they remain a second application may be required. For heavily contaminated sheds where there is a physical build up of mould or algae, the best approach is to remove as much of the surface contamination as possible with a paint scraper, stiff broom or brush first. Soaking the affected areas with the mould and mildew cleaner and allowing an hour or 2 may make this process easier. When back to the bare wood, treat again and scrub the shed cleaner into the timber with a stiff brush then allow to dry. Repeat if necessary. Once cleaned and allowed to dry, sheds should be treated with a shed preservative. Shed preservers will not eradicate mould or algae on their own but once the shed has been cleaned and treated with a mould and mildew cleaner, will help prevent future infestation. Shed and wood preservers are available in clear and coloured formulations so sheds can be left looking natural or stained to a different colour in a single process. Although shed preservatives protect against mould, algae and insect attack, they only offer limited protection against weathering and water ingress. To fully protect the recently cleaned and preserved shed, a top-coat of clear or coloured exterior wood oil, shed stain, shed paint or shed varnish should be applied. These will seal in the wood preservative, protect the shed from weathering and complete the project.